Very nice looking for a cat scratcher. The incline is nice because it's hard to find and cats like it. Doesn't shed too much either as they scratch it. Easy to put together and lightweight. I'd buy it again! Here kitty, kitty! 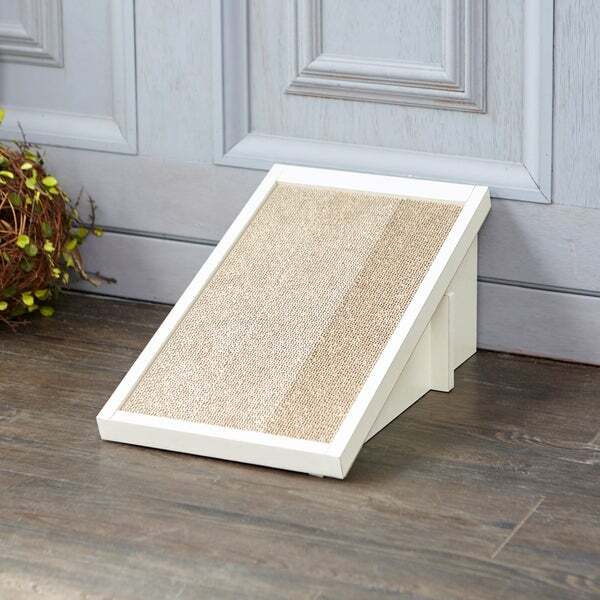 Way Basics Simple Cat Scratcher Incline is a smart and effective way to help your cat lose the urge to scratch the furniture while helping to trim their nails at the same time. This isn't your average cat scratcher as it is on an incline that cats love and it even can blend into any room and look like a beautiful piece of furniture! This product is made out of zBoard, a sustainable and strong patented material that is eco-friendly and safe for your home. Way Basics uses a 3M industrial adhesive instead of hardware. which means no tools are required. No handy man needed, assembly is easy! Dimensions 18.0 In. X 11.0 In. X 8.0 In. 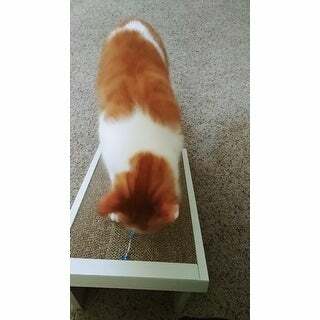 Yes, I recommend the incline cat scratcher. My kitty who is going on 12 years old , loves to scratch our favorite rug, I was hesitant not knowing if she would change her ways. I easily put it together in five minutes or less , put a little cat nip and she was on it scratching away !!!!! She went back to it as the day went on and first thing this morning .The incline she likes , it's more like scratching her post without having to stand up , but purfect angle for her back . She's happy so I'm happy . My cat ignored this for a few weeks and continued to attack our couches until I figured it out. He likes playing with twist ties so I taped one to the back and bent it down onto the scratch pad. Now he loves this thing and hasn't touched the furniture since. Marvelous! Love this Cat Scratcher. It is so much sturdier than the cardboard scratchers I've purchased in the past. It is more like furniture than a throw away. And, the best part, my cat loves it. He doesn't even think about honing his claws on my couch anymore! The cats love this, and it’s very sturdy. Looks great! Very nice and easy to get put together . My kitten's love it . "Hello, How do you get refills for the cardboard cat scratching part? Thank you, Elizabeth"